Guest Coach Jessica here with a new feature we would like to call - #LikeABoss! #LikeABoss - We love to see people go after their "why" and win! Every month, Rowan Coaching features the story of someone brave enough to ditch the shoulds and carve their own path. For our first post, we are thrilled to be featuring Julie Wojno (Columbus, OH). I had the biggest pleasure to meet Julie in college. If you can't already tell from her picture, she is simply the friendliest human on the planet. 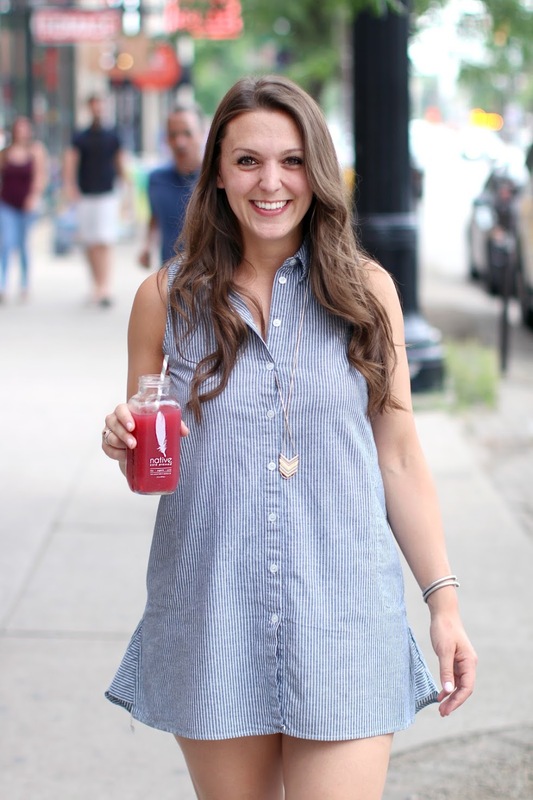 Her charm, smile, and positivity are completely infectious when she's leading classes (she's a personal trainer AND a cycling & yoga instructor!). Julie recently left her 9-to-5 to pursue her health coaching business full time, and she is off to a flying start. This opportunity allows her to work remotely, and to live her passion - to promote healthy, loving relationships with food and our bodies. See what she has to say below! We are so excited to chat with you! Could you tell us a little bit about who you are and what you do? I am a health coach, yoga teacher and cycling instructor. My mission is to empower women who have struggled with eating, exercise and body image to love their bodies and live their best lives. I'm a firm believer in intuitive eating, and thus work through the principles of intuitive eating with my clients to free them from the war on food/their bodies forever! You recently ditched the 9-to-5 world. How did you arrive at this choice? I remember being in college (5 years ago), I was a personal trainer and group fitness instructor on a mission to empower women to exercise and nourish their bodies to feel good and to empower themselves to live a long, incredible life -- rather than being so focused on things like their weight or their size. I wanted every woman I worked with to feel beautiful just as she was. I remember back then thinking, "somehow I want to spread this message..." but I didn't quite know what that would look like yet! I went to graduate school to study the impacts of mass media + interpersonal communication on body image, and then spent a few years working in public health. When I started to learn about health coaching, it just seemed obvious: this is was I was meant to do! I wanted to be 100% invested in my passion of empowering women. Once I realized that, the choice was easy. It wasn't, "I want to," it was, "I have to." What did you want that you were not getting from your traditional career? I wanted to be directly working with and empowering women! I wanted to live a life where I felt like every day I was doing something I was deeply passionate about. I wanted to feel like I was living out my life's purpose. I knew that doing project management from behind a desk wasn't it for me. I also craved more freedom. Freedom to be more creative and freedom to travel and live the life of my dreams. Since we are highlighting #remotework this month - where do you get your best work done? I LOVE coffee shops! There's something about the buzz of energy around me that absolutely fuels me! If I'm not at a coffee shop, I'm on my patio with my Bernese Mountain Dog, Maple, laying at my feet! Give us the scoop – what is your new business all about! My business is all about empowering women to break up with the dieting mentality, to tap into their intuitive eater, to love their bodies and live their absolute best lives. Tell us more about your services (maybe even give us a link!). What should clients expect from the Julie Wojno Health Coaching experience? What I am here for, is to bring out your inner wisdom. I firmly believe that we are all the expert on ourselves! Nobody knows you better than you do. I just pull that out of you. My clients can expect me to hold them to their absolute highest vision of themselves. I never doubt my client's greatness, and that is a powerful experience. How is your service different from big name health coaching companies? I've experienced the struggle of being in that war on food and hating my body. For so many years of my life, I didn't wear shorts because I was self-conscious about my legs. I was constantly trying to be a size that was not healthy or even possible for me. I thought my worth was based on my weight. My journey to overcoming this, my journey to loving my body and living my best life is exactly why I'm now a health coach. Because I want to help other women get there too. I don't believe in chasing some "perfect ideal," I believe in creating our OWN ideal. How has coaching enhanced your process, philosophy, services, and/or relationship with your clients? Coaching is at the core of everything, because it helps us dive deeper into all aspects of life. One of the biggest things I hear my clients tell me is that when they are able to overcome their food and body insecurities, they have all this extra brain space to accomplish other things they're passionate about! How cool is that? When we free ourselves from things that hold us back, our world opens up in so many exciting ways. We may be more present in our relationships, or have more energy to be more invested at work. Or perhaps we'll go on that trip we've always wanted to...! If you ask me... that ROI is priceless. Loving our bodies and living our best lives. How have you changed as a result of leaving the traditional career realm? I just left two weeks ago! But thus far, I can tell you I finally have balance in my life. My stress levels are lower, and I feel deeply satisfied with how I am spending my time. I am just starting to launch workshops at a local yoga studio, I'm super excited about that! Do you plan on taking remote clients? Yes! I already have two who live in Boston! (I'm based in Columbus, OH). Do you offer a free intro? Absolutely! All my clients begin with a free Love Your Body, Live Your Life Discovery Session. We may or may not be obsessed…How can we follow you, your business, and become a client? You can follow me on Instagram, that's my main social media account: @julie.wojno, I also have a Facebook page: Julie Wojno Health Coaching, and my website is www.juliewojno.com! To become a client, fill out a form to do a Discovery Session, and we'll go from there!